During the first week of my recent family holiday to Sri Lanka, I was plagued by the unpleasant sensation of bile rising up in my throat. I wasn’t quite sure if I was reacting to the sudden stifling heat and one too many serves of sambol and coconut roti, or if it was the presence of my mother I was having difficulty digesting. 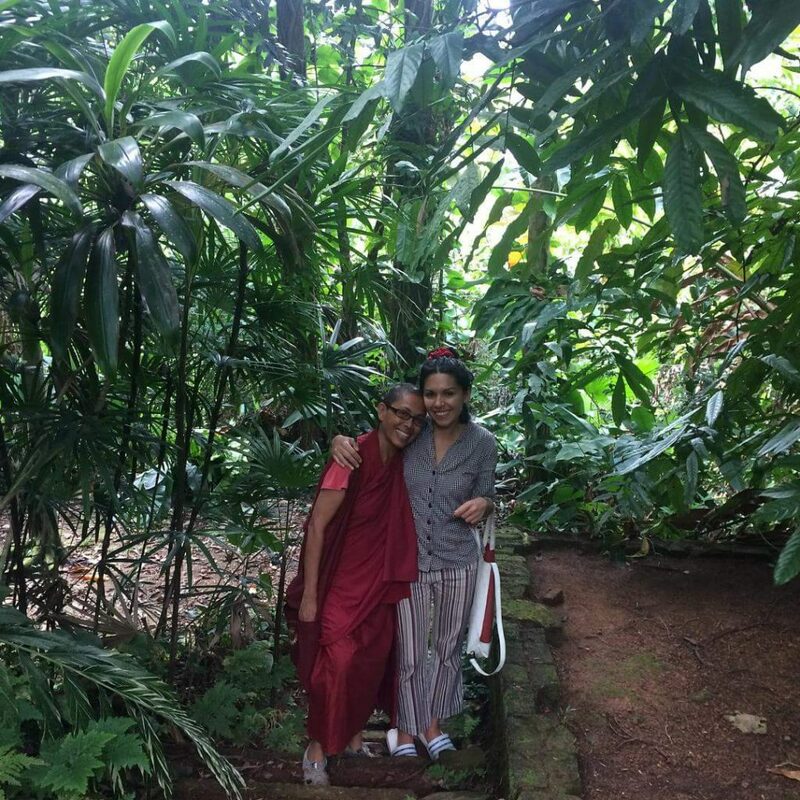 My sister and I had recently touched down in Colombo to spend time with Mum for the first time since she became a Buddhist nun two years prior. Since then, my interactions with Tenzin Lekdron–the new name assigned to her by the Dalai Lama–had been largely limited to social media, where she existed as a Facebook icon with an uncanny valley similarity to the mother I remembered. Like a teenage daughter adventuring on her gap year, she would send occasional emails chronicling her escapades: Tenzin getting her head shaved, Tenzin smiling, flanked by two well-meaning white nuns, Tenzin wandering somewhere in the Himalayas. I gave up attempting to adapt to this jarring shape shift across continents, preferring to bury it in the mental equivalent of the “other” folder. Tenzin did visit Australia once after “taking robes.” The shock of her shaved head and maroon dress shattering my internal narrative that this new vocation was a peculiar dream I would soon wake up from. We role-played normal mother-daughter activities like going out for breakfast and even to the pub, weathering the double takes of curious onlookers. I was trapped in a cycle of shame: embarrassed by her conspicuousness, afraid I would be spotted by a surprised acquaintance or taken as her trusting devotee, and simultaneously ashamed of my inability to adapt to this Mum 2.0 iteration. I wished I could be the accepting person I wanted to be, but my mother’s image left me in confused, angry tears. I listened to her fevered soliloquies about the merits of mantra recitations, silently seething, and felt acutely that my creator had been transformed into an unfamiliar alien life force. I mourned the loss of Shiro–the mother of my childhood and adolescence–with her penchant for permed hair, leopard print, and blasting Cher and Tina Turner. One year she got glamour shots taken at the local shopping center, all Vaseline lens and black lace. Contrasted with her current aesthetic, they make for an amazing seductress to nun makeover montage. Let’s just say Mum was more Madonna Queen of Pop than Virgin Mary for the better part of my life. As an immigrant single mother she was hard up, but deft at conjuring everyday magic. She reimagined our suburban morning commute as a sojourn through the South of France for the likeness of the bright yellow sunflower fields, made a game of enlisting us to lock the doors to her illicit hydroponics room before our conservative relatives came over, let me trot off to school outfitted in a mini leopard print jacket and Spice Girls platforms, and even brought us along on her (g-rated) dating escapades. Like an expert advisory panel, we insisted she dump one could be daddy on account of his embarrassing moccasins. It made sense that my sister and I got to weigh in–we were a package deal. It’s easy for me to romanticize this lost figure, but worth remembering that the loud power ballads were often accompanied by alcoholic binges and manic depressive episodes. Mum always had the tendency to herald whatever new thing crossed her path–a book, an idea, a person–as the second coming. I’d seen it happen many times before Buddhism came along. There was her formidable collection of self-help books, her stint as a born again Christian, and that time she eagerly signed up as a Herbalife distributor. Personally, I can relate to her enterprising, short-lived enthusiasm for malty shakes. It was the 90s, before everyone knew what a pyramid scheme was–and, between you and I, the French Vanilla flavor is to die for. When Mum declared she wanted to become a Buddhist nun, I felt the way I imagine most parents do when their kid announces they’re joining Greenpeace or becoming an astronaut: supportive, but fairly certain it was a fleeting fixation. It turns out it wasn’t. Right up to her ordination, she ate meat and labored over how she would look with a shaved head, but actually followed through. During that first stilted week in Sri Lanka, back in my mother’s life, I wondered how much all that meditation had really changed her. Starved of outside company, or at least company she felt comfortable letting her nun-guard slip around, the criticism flowed out of her in bilious waves; this person was self-centered and reprehensible, another, uniquely selfish. How unfortunate was her karma to be surrounded by such people? She’d default to vague arguments about how “science has proven Buddhism” and snap when challenged. “Aren’t nuns meant to radiate serenity and mindful non-attachment?” I’d remind her, smugly. When this parental plot twist first broke, I imagined family holidays to a monastery set on an Indian cave, where we’d catch Mum on her meditation and levitation smokos. Instead, she lives between apartments in Colombo and Kandy, two of Sri Lanka’s largest cities, studying and teaching Buddhism. The first time I saw someone bow down and literally kiss the ground that my mother walked on, I was seized with a surge of revulsion. People are always harping on about how Buddhism is a philosophy not a religion, but I’m not sure how you explain the deification of very human beings if not the blind faith of religious belief. While I soon found out that attending a guided meditation led by your mother is a cruel and unusual torture, I was intrigued by the gaggle of young, trendy Sri Lankan disciples that swarmed around her. “She’s so cool,” they enthused. I have to admit that I can see the appeal of her distinct brand of accepting, questioning devotion for the contemporary Lankan looking for answers. Sri Lanka is a developing country with weak to non-existent social services and stigma around mental health. For better or worse, people turn to religious figures for guidance. Many young monks prefer to study at university rather than spend their days providing pro-bono counseling. Those who are willing to offer advice tend to be informed by Sri Lanka’s conservative cultural values. It is not unlikely, for example, that a monk will counsel a distraught wife experiencing domestic violence to remain with her husband and exercise forgiveness and understanding. I challenged Mum about how she can bare devote herself to a religion in which monks are made to meditate on the repulsiveness of women’s bodies. She insisted that misogyny has been projected onto the Buddha’s teachings through cultural mutations. Regardless, I take solace in the knowledge that any battered woman who comes to Tenzin Lekdron for advice is not going to be told to turn the other cheek. In fact, she is actively chipping away at Sri Lanka’s deeply entrenched patriarchy and dangerous ethnic and religious divisions, hosting women’s circles to create a space where voices so frequently silenced can be heard, and organizing inter-faith religious events. I console myself with a new, equally tenuous narrative: my mother is basically a social worker who just happens to dress exclusively in maroon. In the end, what convinced me that Mum actually had changed had nothing to do with Buddhism. It was witnessing the thoughtful patience with which she tended to the plant and herb garden flourishing on her back balcony. Sure, other people may have reached that state of quiet contemplation by joining a community garden rather than a convent, but all power to her. People tend to react intensely when they find out that my mother is a Buddhist nun. Her actions defy society’s accepted terms of motherhood, and she is either applauded–“she’s an inspiration to us all”–or crucified–“how could she have done this to her children?”–for it. There’s little room for that sticky space between, which is much closer to the truth. Like plenty of people, I didn’t get the perfect mother I wanted or thought I deserved. I got a multidimensional, real, live human, whose existence in this lifelong state of flux we all inhabit happens to play out more obviously than other people’s. I am grateful to her for teaching me that everyone, and especially women, must claim the space to dictate the terms of their own lives, whether or not others agree with their choices. When I think about it, if anyone was going to abandon their checkered life of sin to become a nun in their mid-50s, it was Mum. She was always all in or nothing, with zero fucks to spare for social expectations. I wish I inherited her strength of character, but instead I got the penchant for leopard print and Cher.